I purchased this unit a few weeks ago and am really enjoying it. Many moons ago I was really into strength training but currently my goals are more geared towards leaning out and getting that narrow fit physique and that seems to be what this system is good for. I have some wrist issues and I find that the ergonomics of this set up doesn't seem to affect those issues as much as free weights. All in all it's a good setup but include a seperate cardio portion and it would probably help to have some free weights available to mix in to your workout as well as in certain situations the included rods aren't enough and upgrading the power rods can be pricy. Also, it's probably pretty safe to say you could save a lot on your initial purchase if you buy used. Performance Good depending on your goals. If you are looking to be a hulking beast, save your money and go with free weights. 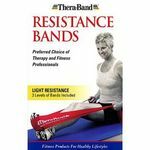 Ease of Use Steep learning curve but once you figure it out transitions between exercises and picking proper tensions is a breese. Durability Well made, and power rods come with a lifetime guarentee which eases the mind a little bit when you are bending them to the floor. Design Pretty ingenous. I like that the system is quiet and smooth. If you want a good work out but don't want to go all the way to the gym this is the thing for you. This is a total body work out machine. It is worth every penny. It's strong, durable, and pays for itself in the end result of your bodies physical appearance and over all good health. I work out 4 times a week on this unit and within 6 weeks I had seen results and so has everyone else. That alone was good enough for me to know it was well worth the money. Let me start by saying I am NOT a daily exerciser, nor do I diet. When my size 16 jeans started getting tight I decided it was time for a change, I checked out the Bowflex site and filled out the credit app. I did not do the six week weight loss plan as that includes a diet and I dont do diets, I did do the Better Body workout, 20 minutes a day 3 days a week, within 8 weeks my pants were literally falling off me, so I upped my workout to 20 minutes a day 5 days a week and its nine months later and I'm down to a size 8-9!! 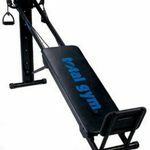 This is a really nice machine, not overly large and very easy to use, the Ab Crunch Harness is a great benefit. The User Manual/Fitness Guide gives easy to use instructions for each of the over 65 exercises, it also included a Better Body workout poster to hang by the machine so you dont have to use the book.Bowflex offers a 6 weeks fitness results guarantee**, **if you use it for 6 weeks and dont see results you can return it for a full refund,(if you talk to a salesperson when ordering you can get them to offer free shipping and free return shipping if your not happy) and machine is guaranteed for seven years with lifetime warranty on Power Rods. 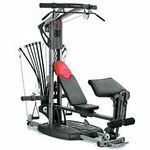 Okay, the Bowflex Extreme SE Homegym seems fairly expensive at first - but my husband and I counted the cost this way: 1. Qualifying for credit with them IS a good revolving account. (Good for building credit) 2. There are several safety features of the gym itself. 3. It's right in our home. No travelling to a club and looking fat in spandex. 4. The website seems to provide excellent customer support. 5. The equipment is sturdy BUT you have to put it together yourself. 6. Monthy cost at curves is between 30 and 70 bucks a month (just for women) and a family membership at a co-ed club could cost up to 150 bucks a month. The Bowflex is about 50 bucks a month. 7. The whole family can use it. (Except small kids) 8. There aren't any "free weights" to store and take care of (keep from falling off the bar and onton little kid's toes) 9.There is an instructional DVD But - You DO have to dedicate space and time to this. That seems obvious - but I HAVE had mine for a year and only just begun to use it effectively. It doesn't store. You set it up and it stays there. I would get a cargo box or large plastic storage box to put the accessories in (hand pulls, straps, etc) when they are not in use. While it does have cardio (rowing) exercises - this is a muscle building machine. I didn't watch the DVD - I just jumped right in and would give it a good hard ten minutes. Finally, I put in the DVD and found out I was doing everything WRONG. Go slow, build muscle that burns fat, etc. Also, properly maintaing your machine gives it a super-long life. The RODS are safe for kids to be around - and you can even put very low weight on it and allow school aged children to use it. 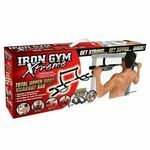 I thought, at first that it didn't come with enough weight (there ARE expansion packs) but when I actually did the instructional video workouts - I found that I used far less weight. Now, we are still paying the thing off - it seems that they do have a high interest rate and there are really high late fees. We made one late payment! But, if you paid for this the way you would pay for a fitness membership - you'd have the thing owned in no time. Bowflex will send you regular reading material on health and fitness and you do usually get a "free personal trainer" if you have access to the internet. Basically, it gives you instructions on exercises to do. But, this has been more beneficial that I had originally thought. Don't overlook the importance of reading and viewing the educational materials. They are very informative and encouraging. It feels like Bowflex is supporting you on your mission to build muscle and lose fat, etc. 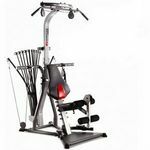 I bought a Bowflex X treme SE six weeks ago and love it already. Work out three times a week about an hour and already can see and really feel results. I have also added three really long walks a week and in combination cant wait to see results in six months. Should have bought one long ago !! !